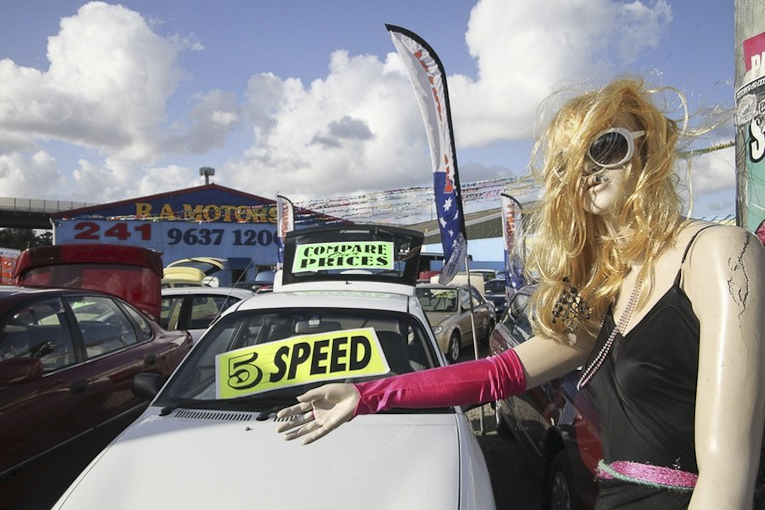 Fiona, changeable mascot of RA Motors, Granville (from the series ‘Parramatta Road’). Courtesy of Lyndal Irons. In the realms of emerging photographers, the work of Lyndal Irons feels strangely refreshing, almost comforting. Through gentle negotiating and a sincerity towards her subjects, Irons and her lens capture scenes from Sydney’s landscape otherwise unknown or forgotten by the rest of the us. There is no irony, and nothing is forced upon the viewer. What you see is simply what is there; everything else comes from your own baggage. Irons describes her work as being about “disappearing social history”, a peek into the fabric of Australian culture. Across works investigating the arcane world of Physical Culture, the regulars who frequent Sydney’s pubs, and an ongoing quest to document the inhabitants of a major Sydney traffic artery, you never feel as though you’re imposing upon someone’s world as you look at Irons’ work. Because she is just as interested in the subject as you are. Her most recent project is Goodbye Oxford Tavern, a documentation of the final two days of trading at the notorious Petersham pub before its transformation from showgirl lounge to post-American eatery. After a wildly successful exhibition at The Fracking Redundants gallery in March, a photobook containing images from the show and accompanying stories is now available through Amazon. We’ll be talking to Lyndal this evening about Goodbye Oxford Tavern, along with her other works such as her continuing project Parramatta Road, a documentation of businesses and residents along Sydney’s famous stretch of bitumen. Tune in tonight from 6pm on Eastside FM 89.7 to find out more, or as always you can listen online here. A couple celebrate their first wedding anniversary with family at Stanmore McDonald’s post midnight (from the series ‘Parramatta Road’). Courtesy of Lyndal Irons.